My friend Tony from the OCR team “MIAMI Mudders” has been telling me about Shale Hill Adventure Farm in Benson, VT for a while, and how amazing both the course and owners Rob and Jill Butler are. 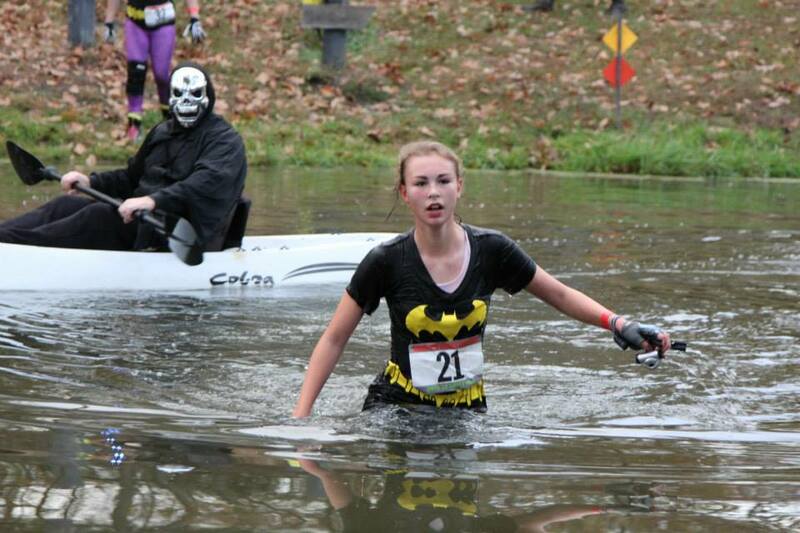 So when the opportunity came to go run the Halloween 10K Run, I jumped at the chance. Shale Hill Adventure Farm has fifty-one obstacles many of which are unique or just plain badass! One of the first obstacles I came to was “Teeter Totters” which is basically a big wooden version of a kids seesaw. At this point I had caught up to others on the course, so I was able to watch others do this obstacle prior to attempting it. It had rained earlier in the day and this made this obstacle slippery (which Rob pointed out in the pre-race meeting). With only one week away from the OCR World Championships I didn't want to risk injury, so I took did this obstacle sitting down. I am happy I chose that technique as the person next to me tried to walk it and slipped and fell off. Up next was the “Tire Flip”, the obstacle is pretty simple, and whatever number is written on the tire is how many times you must flip the tire up the hill and then down the same hill. I saw a tire with a “1” on it and thought I like that one, but it was huge and full of water and I could not lift it! I went to the next tire, which had a “10” written on it so up the hill I flipped the tire 10 times and then down the hill 10 times! The next few obstacles were all challenging. I have seen a lot of the obstacles at other events but not as big, long, or challenging as the versions Shale Hill has. The “Sand Bag Carry / Slosh Pipe Carry” was especially challenging, on the 10K version of the course you have to carry a sixty pound sand bag on a long trail that has you climb up and down some steep hills. At this point I knew I messed up with my pre-race supplements and I was starting to bonk. Up next just after the Sand Bag carry, was a “Pond Traverse” across a decent size pond, this was another obstacle I have seen and done before, but this version was on steroids and you had to cross a pretty large pond. 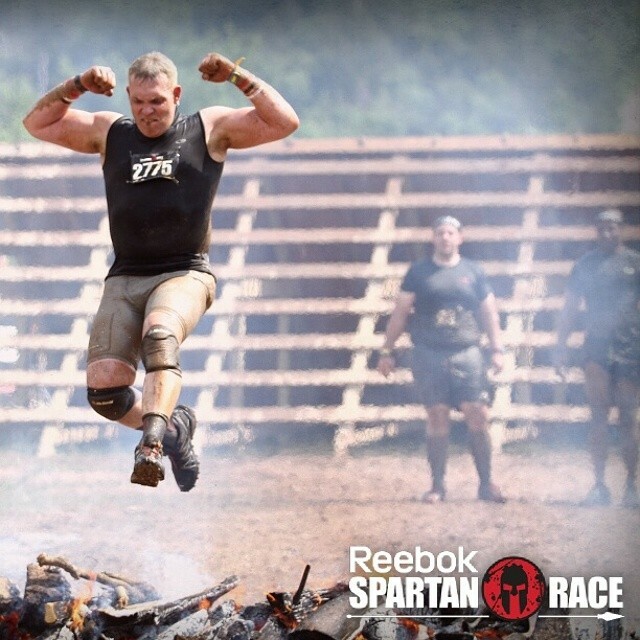 The next obstacle “Gut Check” was yet again, something I have seen many times, but not at the scale of this one. “Gut Check” is two logs a good distance apart from one another and you have to jump to the higher log and climb over it. My bursitis at this point was really hurting and this proved to be harder than I expected, but I was able to do it! 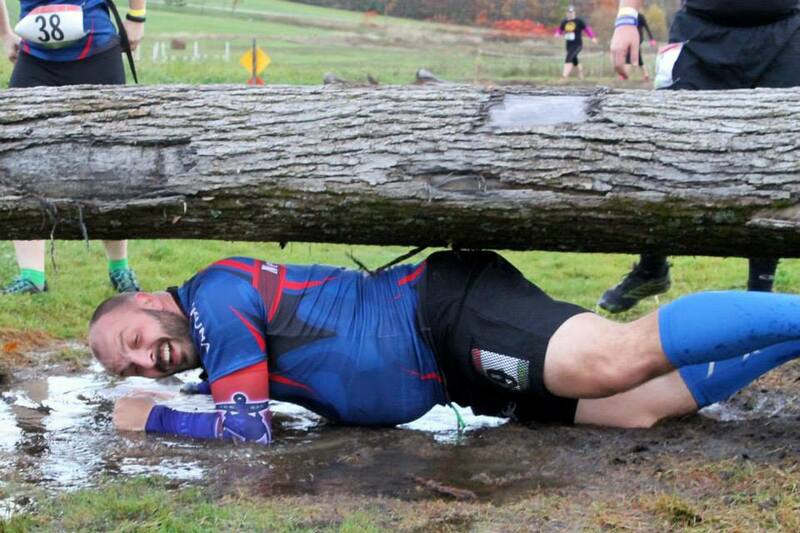 I then came to “Tire Pull” and I have to say that may have been the easiest obstacle on the entire course. Now came an obstacle called “Rope Ramp”, this is not something I had seen or tried to date so I was very intimated by it. 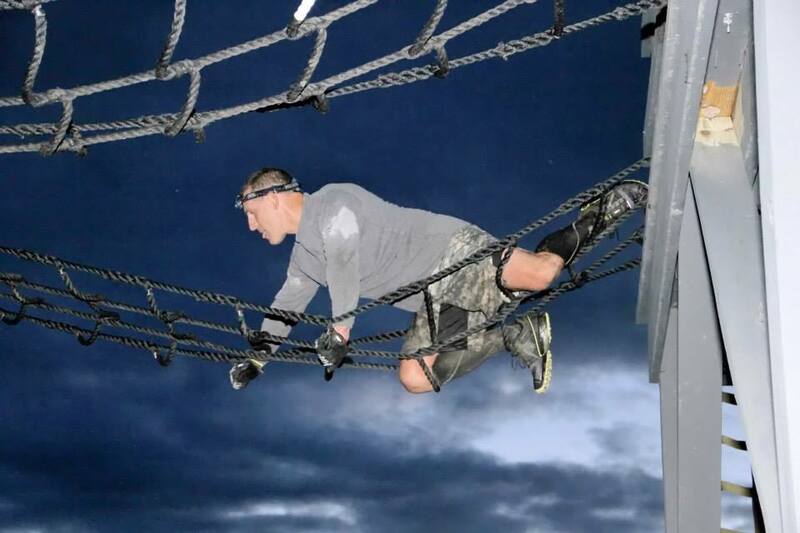 The obstacle has you climb to the top of a rope and then you have to pull yourself up over a ledge and climb down an incline ramp. I climbed the rope with no problems, but when I came time to pull myself up the ledge, I got scared and mentally had already failed. I climbed down and was about to do the penalty (25 spider pushups) when the obstacles volunteer Sean said I needed to try again. He explained that my technique was good and I would have no problems with the obstacle. I really didn't trust him at first, but now another volunteer Rommy, was saying I could do it. I hate to fail obstacles so I tried again, I won't lie, the rope was pretty high and if I screwed up, I would probably break an ankle so I was still hesitant about this one, but Sean and Rommy not only encouraged me the entire time they coached me throughout the entire process and I was able to climb it! 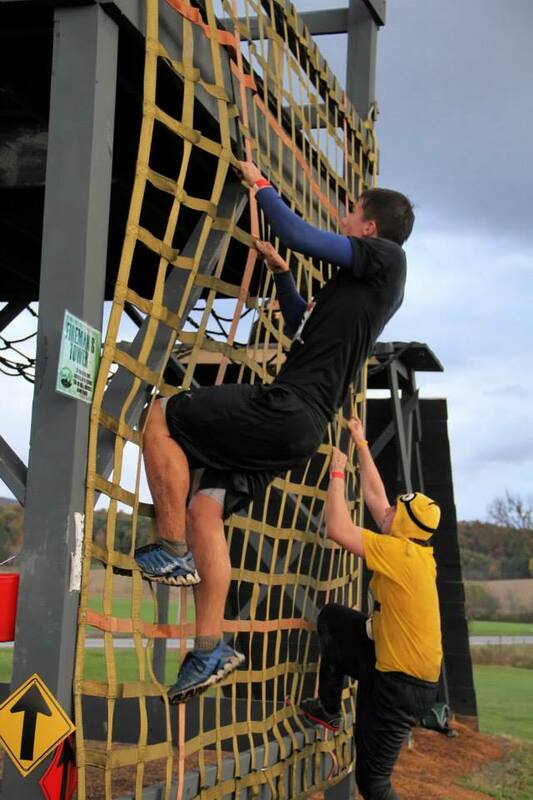 I was so happy to have completed this obstacle and made sure to ask both their names to include in this article. The next few obstacles were all very cool and challenging, with the abacus being a very cool giant rope and wood ladder that was fun to climb. I then came to the “Linkin Logs” obstacle, which I have seen pictures of but never attempted. The obstacle is basically a rope with a huge Linkin Log tied to the bottom and you have to first climb the log using very slight notches carved into it and then climb a rope. This proved to be a challenge for me with my bursitis, but I made it to the top. Not far ahead was the next obstacle, “Swinging Ladders” which is a wooden ladder obstacle that requires you to really take your time to get to the top. The next obstacle “Double Up” was fun and a challenge. At this point it was now pretty dark, and I had turned my headlamp on. Up next was “Cliff Jumper” which you have to climb up a rope and then hook your feet to a ledge and climb over to the ledge. In the dark and after the twenty-two previous obstacles this looked a lot easier than it is, so I was very happy to complete it! Up next was “7′ Ladder Wall” and then came the hardest wall traverse at any OCR I have done so far. The “Great Wall Traverse” is amazing and brutal all at the same time. You have to traverse a wall than a balance beam, then another wall, then shimmy across a beam with your hands much like monkey bars, then another wall and then if I recall another balance beam followed by another wall and then another balance beam monkey bars and then on to the last wall. This obstacle beat me down, but wow, what a challenge! Rob also explained during the pre-race meeting that you had to a do a penalty (25 spider pushups) for every part of this obstacle you failed! 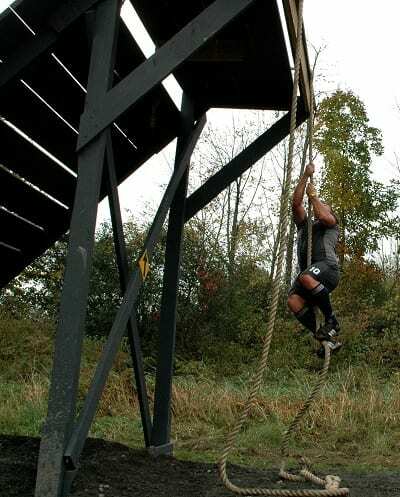 The next two obstacles were a nice chance to rest after some of the harder ones, “Heinous Hoist” and “Barbed Wire Crawl 1” both gave me a chance to catch my breath. Up next was “Alcatraz Wall” which is a nice tall and slanted wall that was also slippery, from the earlier rain, I didn't use the best technique on this obstacle, but I was able to complete it! The next obstacle was “Balance Alley”, which in the dark was not as easy as I expected. The next obstacle was yet another that I found to be an opportunity to get some rest, as it was “4′ Vaults” which I had no problems with at all. I then came to the “Fireman’s Tower” which had two options to climb to the top of a platform; you could climb the Fireman's pole or pick a cargo net. I tried the pole, but it was really wet, so I had to use the cargo net. Once up on the platform I had to transverse across a rope type bridge to the other side and then slide/climb down a slanted ramp. Up next was a nice and easy “Tire Bridge” obstacle, which I was able to make my way through the tires without much difficulty. The second “Barbed Wire Crawl 2” was up next, which wasn't as cold as I expected it to be on an October evening. I then did “Kindling Karry” and somehow I missed the correct course for this one, and I ended up carrying the log for a while and it was only when Rob showed up on his ATV to check up on me that I learned I went the wrong way with the log. Rob said to leave the log where it was and continue on. It was now time for one of Shale Hill's signature obstacles, “Loom”. I had to climb up a series of levels and at the first level I climbed over the wooden bar and then the next under and then again over and then again under, all the time going upward. Once at the top I then had to cross a rope to get to the other end of the obstacle to be able to climb down. At this point Rob was with me, and he was amazing, he coached me throughout this entire obstacle and he told me the best way to cross the rope section was to use all three ropes and create a rope bridge. I sort of did this and was able to get to the other side and complete this obstacle! Now came the “Hay Bales from Hell” and I have to say that's exactly what they are. Especially in the pitch dark, because I couldn't see all the hay bales until I was right next to them. I started to hate Hay Bales as I thought they would never end and they were brutal on my bursitis. The only fun part is several of them had volunteers dressed like zombies or ghosts hiding in them, which at least gave me a chance to talk to someone for a moment. The monkey bars at Shale Hill are definitely unique, “Flat Monkey Bars” and “Uphill Monkey Bars”, I hate to admit it, but my surgically repaired shoulders were beat up and I ended up having to do the penalty for both sets of monkey bars. 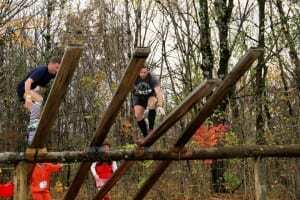 These are not your run of the mill OCR monkey bars; both sets are a really tough and a challenge for just about any OCR participant. I then came to “Hill Scramble” which with my headlamp on was no problem at all. The next obstacle was a nice easy climb over a metal culvert “Culvert Vault”. 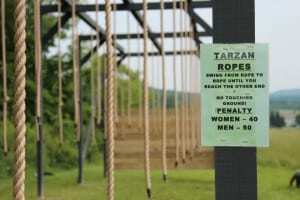 Up next was another Shale Hill signature obstacle, “Tarzan Ropes.” And this is not one rope, but rather a long series of ropes that you have to swing across. I unfortunately did not complete this one and had to do the penalty. Next up was “Pick Your Poison” which allows you to pick from several options. I decided to pick two and did both. 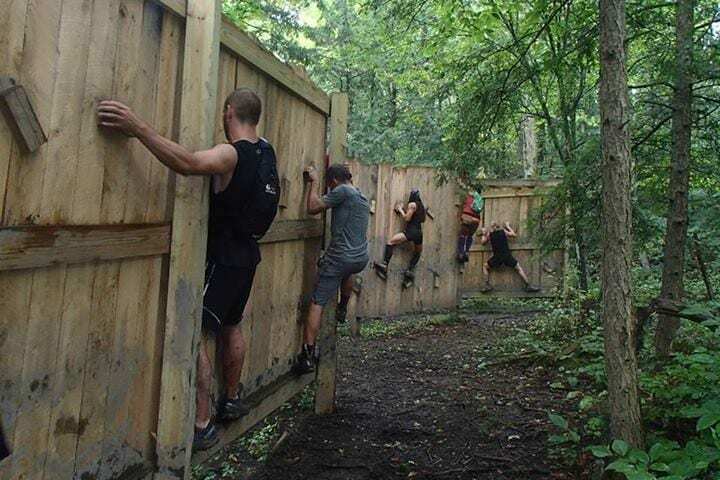 The last obstacle prior to the finish was “Anaconda” which is a trail that has you climb up and down a shoelace type designed path and as well you have to deal with some walls and vaults! The only thing left now was to get up the hill to the finish line, which I was able to do via a slow running pace. The course was both amazing and brutal and beat me up but I was glad I went. It’s not often that I have completed a course and felt like I did after Shale Hill, if you can dominate the Shale Hill course, then you can probably conquer almost any other OCR course in America! The course is the best I have run to date, but to be fair, it's also the first true permanent course I have run so far. Rob and his entire staff are all awesome. I am grateful for the time I was able to spend with Rob both on and off the course. I also met Paul Jones of the New England Spahtens so the day was a success in many ways. 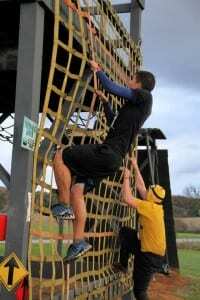 This was not just an obstacle course race. 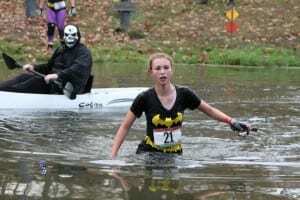 It was also a Halloween event and the course had volunteers and staff dressed in costumes throughout which made for fun times and good laughs. A good amount of the participants stayed for the after party and brought food dishes which all tasted great! The event was fun from start to finish! The schwag was really nice; I received a nice shirt, a car bumper/window sticker, a Cliff Builder’s protein bar, two sets of Shale Hill Eye Blacks, and a very cool custom medal. I really like that they have created a medal that is unique to each event they put on. I am going to rate the event/course 5 out of 5 stars. This is based on the course being amazing, the staff & volunteers doing a top flight job, and most of all Rob spending a great deal of time out on the course with both me and other participants and not just keeping an eye on us but also teaching and coaching us how to conquer his obstacles. I plan on doing as many future Shale Hill Adventure Farm races as I can in the coming future and suggest anyone that reads this article does the same. Have you done a race at Shale Hill? Share and Rate your experience!